Someone has died. That’s the first thing we learn in DNA, Dennis Kelly’s adolescent thriller, and it’s the first in a series of twists and complications that don’t let up until, 80 minutes later, the play has shuddered to an end. 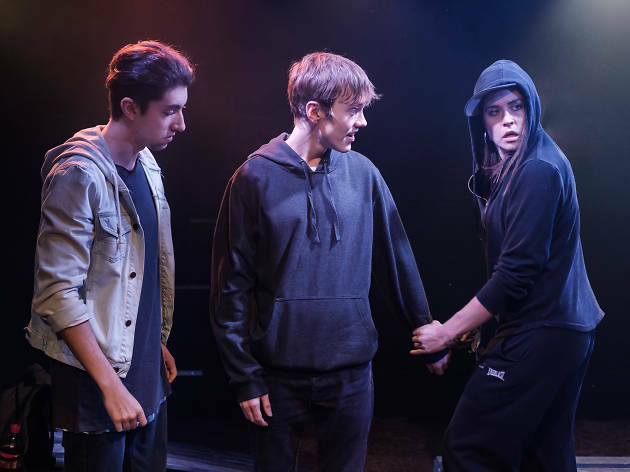 How are a group of teenagers – varying from ‘rough as guts’ to ‘really wants to get into dental college’ – supposed to handle a death for which they might, in some way, be culpable? They have all been guilty of bullying the deceased; they were all present when he died. It’s not clear who killed him, but it could have been any of them — like Richard (Liam Nunan), who is too cool for the others, or Jill (Jessica-Belle Keogh, an immediate standout), the alpha-bully who keeps questioning the allegiance of her hangers-on. Or was it the boy in the corner (James Fraser), who can’t stop crying? But then, it doesn’t really matter: in the eyes of the teens, they’re in it together. In this production, under Claudia Barrie’s direction, the situation feels near-apocalyptic: on a bed of dry, dying grass and wooden pallets (designed by Ella Butler), the students commiserate, threaten, make frantic plans and set up elaborate protection alliances. Everyone is traumatised; almost no one will admit it. But there’s another unexpected element to this tragedy – in the act of the students creating a cover-up, they’ve had to work together. Suddenly, there’s a new harmony in the school. The previous vicious, violent-leaning, bully-rich social hierarchy has settled into something more even and kind. As new complications arise, some of the students start to wonder what’s more important: doing what’s right, or keeping this new, precious peace? Dennis Kelly is no stranger to rebellious children (he wrote Matilda the Musical with Tim Minchin), but this is next level – more twisty, more dark, and probably as plausible as a girl writing a message in chalk with her eyes – from Phil (Bardiya McKinnon), who is near-silent but diabolical, to Leah (Millie Samuels), who adores Phil and talks constantly to mask her anxieties. There’s a recognisable power dynamic in the way Cathy (Jane Watt) and Mel (Alex Malone) are deferent to Jill, who is clearly the bully with all the social power – her smiles are a threat. Wild as the situation may be, there’s enough in the characters that feels genuine, and this lets us buy into the ride. 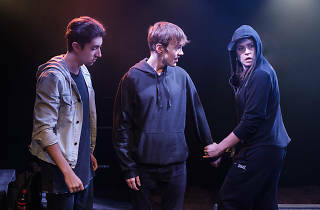 The ensemble of strong, young actors (it also includes Alex Brahman, Jeremi Campese, James Fraser, Emm Wiseman, and Holly Fraser) keep the play moving at a brisk, panicked pace, which feels just right. You might feel wrung out at the end, but that’s because you’ve just been on a theatrical rollercoaster. Whether you find it a good ride might depend on how you feel about all the twists and turns – are you a thrillseeker or do you crave smooth, bump-free journeys? Under Barrie, you can feel every tiny bump like it happened inside your gut. The play’s humour cuts through with sharp, precise timing, but fear and guilt are never too far behind. She gives us the gift of both compassion and foreboding; we know it’s not going to end well, but we hope it does.